Die Sonkring is a South African, Afrikaans-language television drama series which revolves around a woman who seems to bring tragedy and misfortune to those close to her. At the end of their matric year three school friends - Maryna, Karen and Dina - visit a fortune teller. What starts as good fun takes an ominous turn when the seer foretells tragedy in all three their lives - and all caused by Maryna, or "the dark one". While Dina doesn't take the prophecy seriously, it threatens to ruin Maryna's friendship with Karen. In the years that follow, it indeed seems that misfortune surrounds Maryna as her and her friends' lives are beset by accidents, suicide, betrayal, revenge and even murder. There is also a good dose of political intrigue as Maryna's husband (Karen's former fiancé Neil MacDonald) gets involved with the influential and corrupt steel magnate Alwyn Dressler. Will Maryna ever escape the fortune teller's prophecy and will she find love and happiness? The series stars Anna-Mart van der Merwe as Maryna, Henrietta Gryffenberg as Karen, Chantell Stander (Season 1) and Nan Hamilton (Season 2) as Dina, Cobus Rossouw as Dirk du Plessis, Philip Moolman as Neil MacDonald, Theunis Nel as Werner Delport, Rufus Swart as Dekker Hattingh, Trudie Taljaard as Nelmarie Vermeulen, Pieter de Bruyn as Alwyn Dressler and Trix Pienaar as Antie Dot. 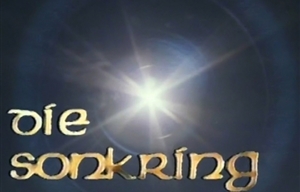 Die Sonkring was created, written and directed by Jan Scholtz and produced by Scholtz Films. The executive producer was Johann Schoeman and the supervising producer for TV1 was Sandra Kotzé. The music was by Fransua Roos.